Recently I read Women at Church by Neylan McBaine. For me, one aspect of the book left me extremely concerned and made it very difficult for me to find the book safe to recommend. She asked what we are going to do if there are unhappy women in our wards—and hoped we weren’t going to decide the women should change. This is an extremely dangerous thought if it means what it sounds like it means. Every time I write an article about happiness and pain being choices, I get angry responses from readers…and yet here I am doing it again. It is just too essential a topic to ignore. People don’t want happiness to be a choice, because choices come with responsibility. It makes life so much easier if we can just sit back and blame others for our unhappiness and if we can insist they be the ones to change, not us. This has been one of my pet peeves with the majority of the more recent feminist writings. I come from a feminist background, and I support some feminist desires (but not priesthood ordination). I do not, however, support approaching it with a victim mentality. My frustration is less with the women who have been trained by others to have this attitude–it is with the women who are teaching it, particularly if I feel they ought to know better. The problem with sitting back and making others responsible for your happiness or unhappiness is that you turn yourself into a victim. The victim mentality is hardly healthy or Christ-driven. The Book of Mormon teaches us that we are that we might have joy and that means we are permitted to be joyful-but it’s our choice. If we choose to spend our lives feeling picked on, God will let us. These things might feel important to us–although they often are because people have talked us into it–but we need to put them into perspective–an eternal perspective. 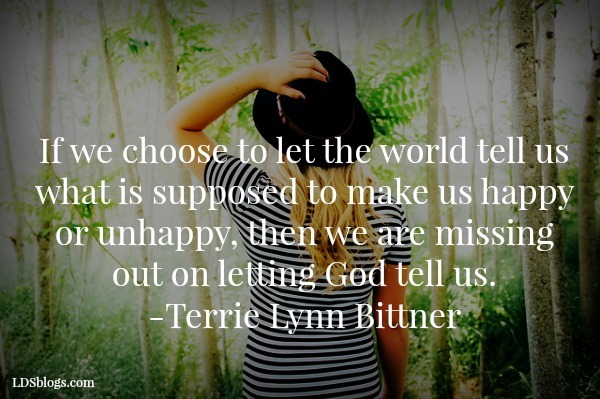 If we choose to be happy, He will also let us do that. Wise people choose happiness. I feel an unhealthy victim mentality is making the current Mormon Feminist movement very dangerous. It’s not something I saw regularly in that movement until fairly recent times and it’s certainly not the feminist message I was presented as a teenager involved in feminism outside the Church. Now, let me just start off by saying that I understand about depression and the impact it has on emotions. However, when I write about happiness and pain, I am talking about those who have no physical reason for their depression (or who have a physical reason but use it as an excuse not to do the best they can within their limitations). I am not talking about someone whose mother died yesterday. There is a natural and healthy time for grieving that was built into our systems. Despite all of that, we still have choices. I have seen people battling tremendous trials who choose to face them with as much happiness as they can manage under the circumstances. People who find themselves in concentration camps, starving while lost in the wilderness, or facing deep poverty, illness or physical pain have sometimes chosen to face it with courage and joy. It’s not easy. I have no doubt about that. I think a certain period of grieving time is healthy and natural—but not a lifetime of it. Nephi tends to come to mind when I think about attitude. He said he’d been blessed all the days of his life. All of them. Think about this—homeless for a long time, regularly fighting off murder attempts by his brothers…but he was blessed all of every day. That’s choosing joy. That is who I want to be. There is no such thing as a life that has everything the way you want it. Life is that way—on purpose, I believe. It’s good for us to learn life isn’t always about us and that life can be joyful without being exactly the way we personally choose it to be. Many of the issues I see mentioned about church are trivial from an eternal perspective and yet I read of women crying in Sacrament meeting over them—more men than women on the stand, not having the Relief Society president sitting on the stand or being called President…they might be annoying, but they are hardly worth spending life crying over. In the eternal scheme of things, which is all that really matters, they don’t matter at all. I can get to the Celestial Kingdom without any of those things living up to my expectations. On the other hand, they can gradually build larger and larger in my mind until I leave the Church over them. I have seen that happen. However important they seem to us, we need to trust God. We need to let Him lead the Church line upon line. We need to learn to find joy in life and not let the imperfect parts, and the imperfect people, ruin our joy. We even need to accept that God might be behind some of the things that bother us and that His plan might be greater than our own. We do not have a right to encourage women to give up. However, if we keep pointing out minor things to them, that is what will happen. We will train them to look for things to be mad about, and once you start doing that, it’s hard to stop. I know–I went through it in my earlier church years. The minor things will build larger and larger until they block the Holy Ghost from being able to communicate with us. Then our testimony is gone and we have lost it because we were focused more on worldly matters than eternal ones. We have a moral responsibility, instead, to help these women learn to live eternally. Learning to live eternally is really hard–it takes good mentors to get there. I was fortunate to have such women in my life. The world has created a list of what makes us equal. It is not God’s list. The world is unable to see things from an eternal perspective, but God is. If we choose to let the world tell us what is supposed to make us happy or unhappy, we are missing out on letting God tell us. I can testify, from my personal experiences, that God has it right; the world does not. To read more articles by Terrie Bittner, please click here. I have no trouble at all with a woman asking for an appointment with her bishop and requesting that worldly issues be changed if they don’t violate official policy. Often those changes have positive values on the ward and they often enrich the church experience. However, if the bishop chooses not to do them for whatever reason, we cannot let them ruin our testimonies or keep us from spending Sacrament Meeting worshiping, rather than monitoring for our version of injustice. We need to stay focused on eternity. Think eternally and choose happiness. This is how God wants us to live.